This heavy duty fiber block is used for supporting a single fiber optic cable up to one inch dia. onto a maximum strand size of 3/8 in. (25mm) prior to lashing. Particularly recommended where a higher level of security is required such as crossing roadways or waterways. Always be certain to use enough blocks spaced close together to avoid any creation of cable sag. This block features the lever operated cam that locks the block in position while pulling, then automatically releases during lashing. The frame is constructed from a heat treated aluminum alloy. Oilite bearings on the sheave, and steel inserts on the underside of each strand hook allow the block to slide easily on strand for positioning. A removable pin keeps the cable from jumping out of the sheave. Pin is tethered to the block to prevent losing it. The frame hooks can accommodate strand from 1/4 in. to 3/8 in. 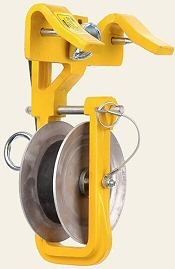 (6-10m) diameter Weight: 3 lbs. 12 oz.